As employers have learned more about the impact of preventable illness on the cost of employer-sponsored health benefits and overall productivity, they have become increasingly interested in company wellness plans that encourage healthy behaviors, such as losing weight or quitting smoking. The most recent Kaiser Family Foundation survey of employers found that 58% of small firms (three to 199 workers) and 85% of large firms (200 or more workers) have some type of wellness program in place.1 Yet wellness plans rarely include preventive dental care. This could be a mistake. Henry J. Kaiser Family Foundation. 2017 Employer Health Benefits Survey. Available at: kff.org/health-costs/report/2017-employer-health-benefits-survey/. Accessed August 15, 2018. 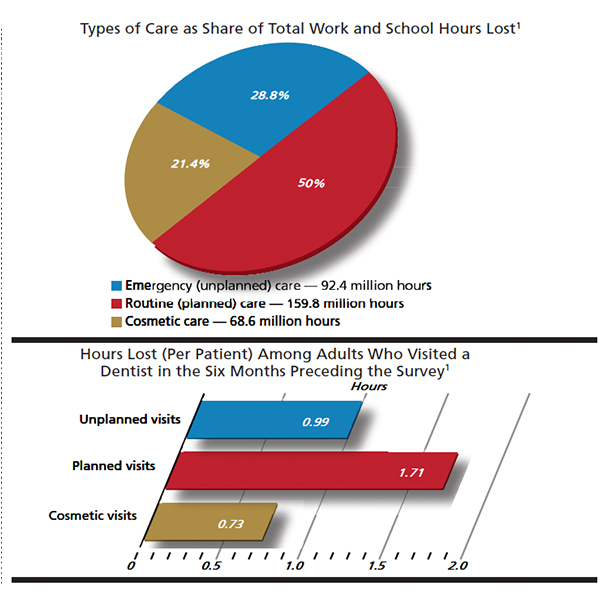 Kelekar U, Naavaal S. Hours lost to planned and unplanned dental visits among U.S. adults. Prev Chronic Dis. 2018;15:170225. From Decisions in Dentistry. September 2018;4(9):46.